Pansy-like pink petals frame a vibrant burgundy heart in this wonderful hybrid. When you want to send a simple yet elegant gift for any occasion, look no further. Like most pansy-orchids, this Miltonia is easy to care for and requires little more than a regular watering along with a dash of TLC. Delicate pink and red flowers are approximately 12 inches tall and shipped with 3-5 buds, which will bloom for up to 4-5 weeks. 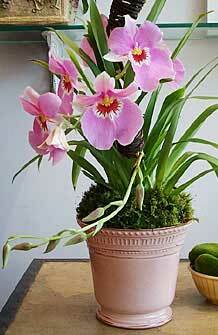 Accentuate the beauty of your potted pink Miltonia in this rustic Italian ceramic Pitcher shown in the picture. Own both of them now and enjoy! For container, view BASKET or choose below.